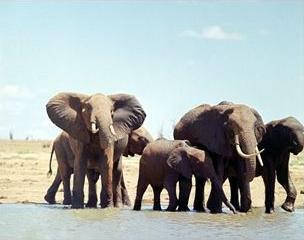 Tsavo - divided in two seperate parks, East and West - is one of the earth’s biggest wildlife resorts. It draws a lot of visitors as it’s only a few hours drive from the airport of Mombasa, Kenya’s second city located at the coast. The coastal area is popular with tourists anyway, and often they combine a stay in a beach resort with a safari here. 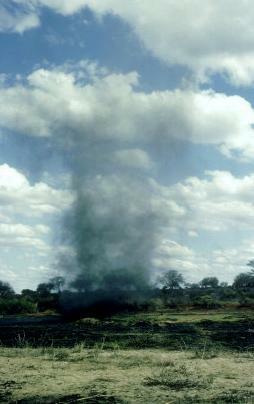 The park is especially popular for budget camping safaris. The Eastern and Western parks - divided by the railway and road from Nairobi to Mombasa – used to be one singly park, but were divided later for administrational reasons. You have to pay the entry fee separately for each park. Generally, flora is more abundant and scenery more versatile in West, but East gives better options for wildlife viewing – for many the main reason to go on a safari – as the park consists mainly of flat, open savannahs without dense vegetation. Typical of the Eastern park is the magnificent red-brown color of the earth and roads, and the lonely baobab trees on the savannah plains. Other points of interest include the Yatta Plateau, with 290 kilometers the world’s longest lava flow, which runs along the western border of the park. The Lugard Falls, named after British colonial administrator Frederick Lugard, is actually a series of rapids on the Galana river. Two-thirds of the park was closed for a long time to tourists, but since January 2006 the whole park is open again. In general, a lot of animals gather around the waterhole at Voi Safari Lodge, at the Kanderi Swamp and at the Aruba Dam across the Voi river. Waterbucks, kudus and dik-diks are common along the banks of the Galana river, one of Kenya’s biggest rivers which flows through the park. At Crocodile Point, you can see hippos and crocodiles. Elephants are mainly present in the southern part, and during the dry season they often gather at Mudanda Rock. Furthermore, the area is home to over 500 bird species, among which are buzzards, kestrels, weaver birds, starlings, herons, secretary birds, kingfishers and ostriches. Game drives, walking, rock climbing, bird watching. Camping sites in the park include Ndololo Camp, which has 22 comfortable tents and a good restaurant and bar, Tarhi Camp, a reasonably priced and peaceful place, and several KWS campsites that move every year. Enquire at the gates. More upmarket places: Kilalinda is a wonderful if expensive ecolodge, where you sleep in luxury cottages. Satao Camp is a popular upmarket tented camp with 22 tents. It also offers guided bush walks and you can rent jeeps here for wildlife drives. The park has no less than 19 airstrips. There are no scheduled flights but the airstrips can be used by (light) chartered planes. Many visitors, however, fly in through Mombasa (Moi International Airport), from there it’s about 2 hours driving. Park entry fees are for non-Kenyans $40 for adults and $20 for children. You can only pay with smartcards, which can be bought and charged at the park’s Voi gate. Totally there are 5 entry gates for tourists. The Buchama Gate is used most by tourists, and good for reaching the Aruba Dam, but far away from the Galana river. Park access is for vehicles only. Visitors can only leave their vehicles at certain designated areas. Off-road driving is strictly prohibited – this damages fragile ecosystems and disturbs animals.